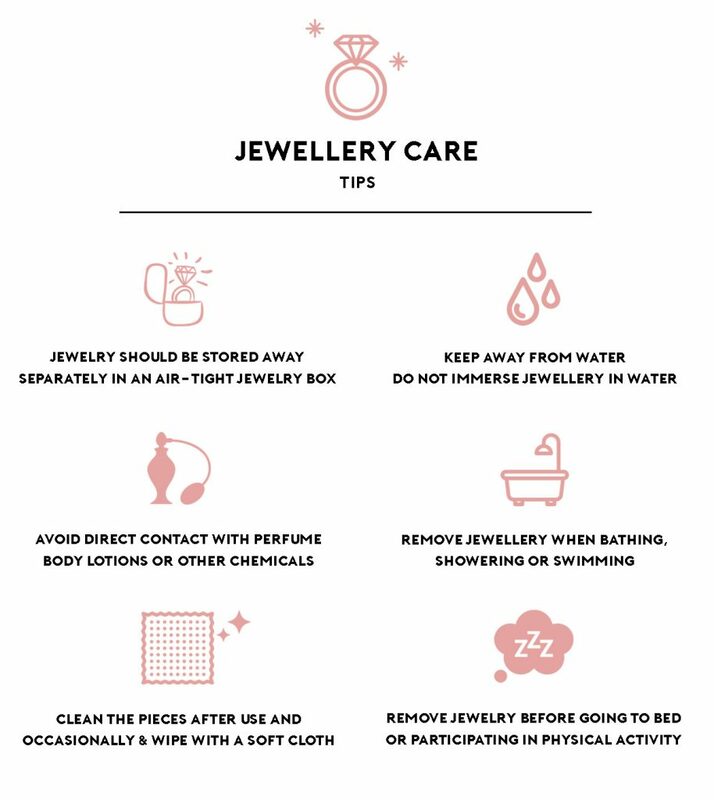 HOW TO CARE YOUR JEWELLERY? Bauble Bible Jewellery is handcrafted and requires extra care to preserve and protect. As with all jewellery it is essential that you treat it with care to keep it looking sparkly and fresh! Please be aware that with most costume jewellery, it can tarnish over time and needs to be cared for. Here are few tips that will help to preserve your piece longer! – Bauble Bible jewellery are best to be kept in its box or wrapped away in a drawer or an air-tight jewelry box. – Avoid direct contact with perfume, body lotions or other chemicals. This will cause the jewellery that are plated to tarnish. – Do not immerse jewellery in water – remove jewellery when bathing, showering or swimming. Do not sleeping wearing your jewellery. – Clean the pieces after use and occasionally. Wipe them with clean cloth to remove any residues. The material we use are mostly gold plated. Eventually over time, the fine layer of gold plate may rub off, exposing brass underneath. The time that this takes varies quite a lot between different people, but you can help to preserve your necklace chain by applying perfume before you put on your jewellery (or even better, avoid your neckline when you spray). It’s also a good idea to keep your jewellery dry and away from sinks, and to buff from time to time with a suitable jewellery polishing cloth. Brass is a material which, when exposed to air, humidity and natural body chemicals will gradually darken in colour from bright gold to bronze. This degree of darkening is also known as the patina of the brass. We use a lot of vintage brass in our designs, at different levels of patination – some are intended to be worn as fairly bright gold, while others look best nice and dark. If you would like to, the bright gold colour of brass can be easily restored by using a straightforward brass cleaner, or alternatively a paste made from a mixture of vinegar and salt. You can clean buy rubbing them on the jewellery parts to get a nice shine. However, many of our customers also like to leave their brass jewellery to grow old gracefully! Some of our premium collection are using hand painted and glazed ceramic pendant. Made of porcelain made them fragile, so take a good care of them while doing adventure together. To clean the pendant, you can wipe them with damp cloth or wet tissue. The pearls used in our collection are simulated pearls. Crystal Pearls by Swarovski are pearls made with a crystal core. Their unparalleled harmonious and lustrous shimmer is achieved using a unique coating technology developed by Swarovski. Each sphere is layered with several coats of mother of pearl. Swarovski pearls, on the other hand, are washable and are not susceptible to damage from perfume or perspiration. They are also more resistant to scratches. We use non-allergenic materials for our jewellery. However If you have any problems with allergies or sensitivity to the materials please stop using the jewellery, and consult with your doctor. Does your earrings hook broken, or the chain is patina over time? Don’t worry! We also offer a repair service for your jewellery. Send them to us and we will repair them for you, we will not charge any service fee the only amount you will have to pay is if there’s any jewellery parts we have to change with the new one and the shipping. For repair and jewellery parts order, please contact us directly at info@baublebible.com.